Note 1:All the data are for reference only,do not use in science and medicine. Note 2:Most of the functions need to be connected to the Phone APP"Fendo"，such as weather forecast，map. Note 3:The step function may be delayed or error due to various changes in the movement of the arms and feet. Note 4:The watch strap only support less than 8 inch of your wrist. 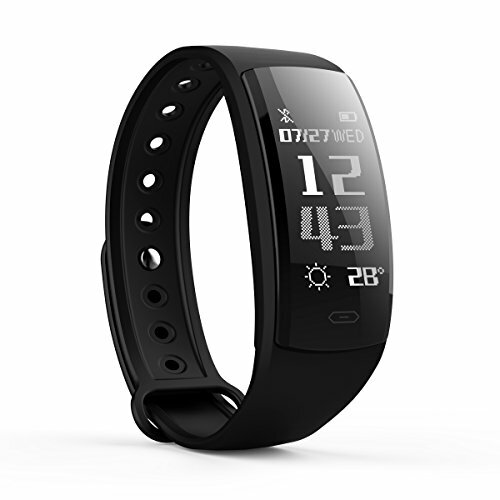 Sundray QS90 Fitness Tracker includes 14 sports modes, which can count the daily steps,calorie counter and distance.Adopting the advanced heart rate technology, keeping knowing your heart-rate during workouts.See call,SMS and SNS notification on your wrist will never let you miss calls and message. Smart Sleep Monitor and Alarm Alert：Monitoring sleep quality about how well and how long you sleep during the night. Numerous Alarm Alerts can silently vibrates you to wake up,do some exercise. IP67 Life-level waterproof can protect the wristband in the daily usage,you can even take it swimming in the pool. With 0.96 Inch Full OLED Screen Easy Watch and Touch: Customizable clock faces for you selection. Connected GPS Running and Walking: Connect to your phone's GPS to see real-time run or walk states like pace and distance and record a map of your workout route. Wide Compatibility and Long Standby Time: Fit for Bluetooth 4.0, Android 4.4 above or iOS 7.1 above only for smartphones. Standby 5~10 days with USB charge port. If you have any questions about this product by Sundray, contact us by completing and submitting the form below. If you are looking for a specif part number, please include it with your message.